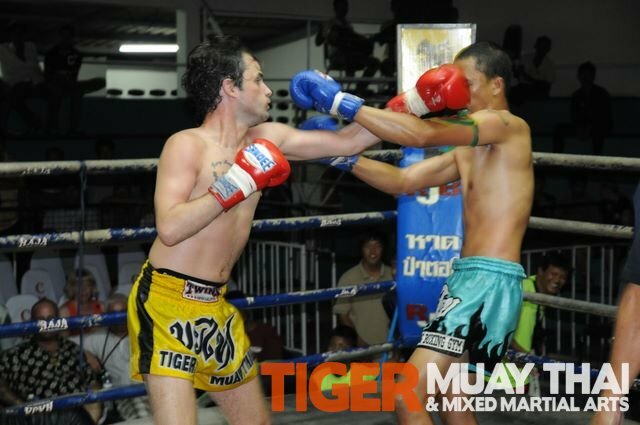 Tiger Muay thai and MMA training camp, Phuket, Thailand fighters went 4-3 in Thai Boxing fights in Patong, Phuket, Thailand on June 25-28, 2010 at Patong and Bangla Muay Thai stadiums. TMT fighters John, jack and Nong all scored KO with KoK winning on points. Hermine, wife of TMT patron and Hong Kong fighter Irshaad, lost a tough fight on points along with Phalangphet. And TMT veteran fighter Richard Bunting went into a 5 round war only to have refree stop fight because of a cut in the 5th round.